Sarah Jio is the New York Times and USA Today bestselling and award-winning author of The Last Camellia (2013), Blackberry Winter (2012), The Bungalow (2011), and The Violets of March (2011), which was named a Library Journal Best Book for that year. Upcoming novels include Morning Glory (November 2013) and Goodnight June (summer 2014). Sarah’s novels are published in over 22 countries. 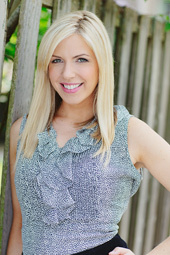 A longtime magazine writer, Sarah contributes to Glamour, O, Real Simple, Redbook, New York Times, NPR, and others.